Alone without a company I brave myself to watch a PhD defense at Aula, my first time going there and watching one. I've read one of the papers written by the PhD candidate, and was intrigued with his study. The process was alien to me, and I was wondering how it goes. Suddenly there was a loud knock on the floor and all the audiences stand. A female with a robe holding a scepter entering the hall with the PhD student accompanied with two paranymphs in their fancy suits. I was dumbfounded, and I can feel my jaw was dropping as I was too amazed with what just happened. Never would I have expected this event was going to be too formal and traditional. As he stand at the podium, he started off with the introduction of his study. I listened to him diligently, trying to get the whole idea. Shortly after he finished another loud knock was heard and the opponents (examiners) and defendants entered the room. I spotted S, my supervisor, as one of the defendants. Unlike the rest he was wearing unmatching jacket and pants with tomato designed tie and messy hair and a big smile on his face. It was hard for me to control my laughter, but S really made the formal event to be more laid back, which I like. The event then started with the opponents asking questions to the PhD candidate, each was given specific time and the candidate answered each of their questions confidently. I had no idea what they were talking about, but I had the feeling neither did the rest of the floor. Whenever the opponents said 'Figure' or 'Table,' all the audiences flipped the paperback thesis that was given to us when we entered Aula, trying to make sense what was going on, and yet failed to grasp the idea (for me that is). When the 'debate' stop, all the opponents and defendants went out of the hall and entered again 10 minutes later with a Doctoral diploma handed to the candidate. At that moment, he's no longer a PhD student, but a Doctor. I was so happy for him even though I don't know him personally. I can imagine the hard work that he went through, and the joy when he received his diploma. 1. Preheat oven at 180 °C. Line parchment paper on 8' x 8' pan with the paper extending at the sides. 2. Combine chocolate and butter in a microwaveable bowl and melt them in the microwave for 2 minutes, stopping at every 30 seconds and mix (or you can melt them using the double boiler method). Let it cool for a moment and combine sugar in the chocolate mixture. 3. Beat eggs in a large bowl, and combine the chocolate mixture with the eggs and mix using wooden spoon. Combine cocoa powder, flour, salt and dates and mix well. Pour the batter in the baking pan and bake for 30 minutes or until the surface looks dry and the sides are beginning to come away from the pan. 4. 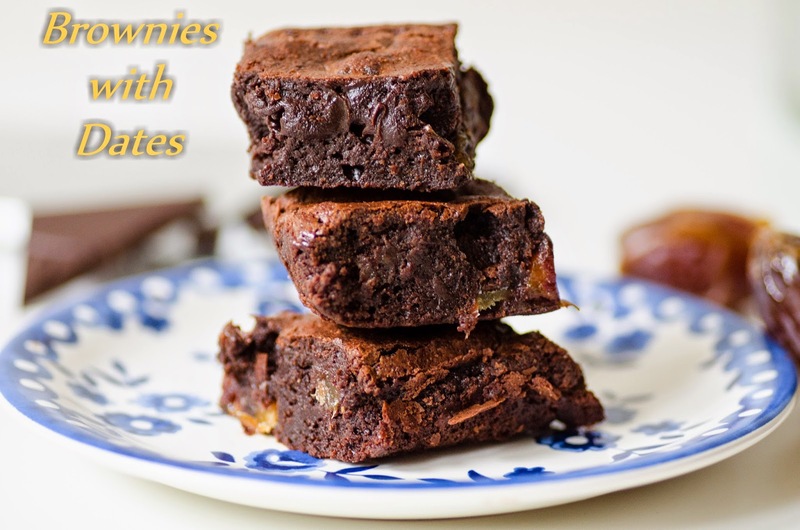 Leave the brownies to cool at the room temperature and cut into 16 pieces.